One year shy of its 150th anniversary, piano makers Langlois & Sons is on the move. The piano sales and service business plans to relocate from its Highway 303 location to Poulsbo this summer. Administrative assistant Michael Patrick Hoyle said the company hasn’t signed a lease yet, but expects to settle in the area of Highway 305 and Bond Road, near Central Market. Hoyle said Langlois will continue piano sales and service at the new store, but also offer a wider range of acoustic instruments and accessories. 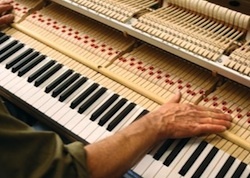 With piano sales declining, the company needs to stay in tune with its customers. Langlois will move its shop between June and September. It will continue to offer tuning, restoration and moving services in the interim. Langlois has about 5,000 tuning clients. Hoyle said the business is offering steep discounts in the lead up to the move to clear out inventory. You can get updates on the Langlois page on Facebook. Langlois has appeared in the Kitsap Sun on a few occasions. We covered the unveiling of a new grand piano and wrote more on the company’s history. The state Liquor Control Board approved a license for a Bainbridge Island marijuana grow Friday, but city zoning could keep the business from opening. The company, Quince Farm, lists its location as 5793 Old Mill Road, south of Winslow. The Bainbridge City Council is close to passing an ordinance that would only allow marijuana grows in an industrial area along Day Road, north of Winslow. Bainbridge’s six-month moratorium on marijuana growing will expire at the end of May.